Gorge Net » Managed WiFi: Blanket Your Entire Home | Life. Business. Uninterrupted. Blanket your entire home in fast, reliable WiFi. In the same way you wouldn’t expect a single lightbulb to fill your entire home with light, you can’t expect a single router to fill your entire home with WiFi. Enter Gorge Net’s enhanced Whole Home WiFi powered by eero with TrueMesh technology. TrueMesh technology knows the signal strength between each eero in your home and calculates the best path from your device to the internet. If there’s a disruption on any part of your network — like if a pet knocks an eero Beacon out of the wall — TrueMesh dynamically reroutes traffic to keep it perfectly balanced. All this happens in the background so you don’t notice a thing. See your speeds, see your connected devices, check their data usage — all in real time. Set schedules, create profi les for devices, or just shut the whole thing down if you want to go off grid. Get system updates, security patches and more automatically. There’s nothing you need to do. Whether it’s an apartment, a townhome or a single family home – it doesn’t matter. Gorge Net’s enhanced Whole Home WiFi works in any home of any shape or size. 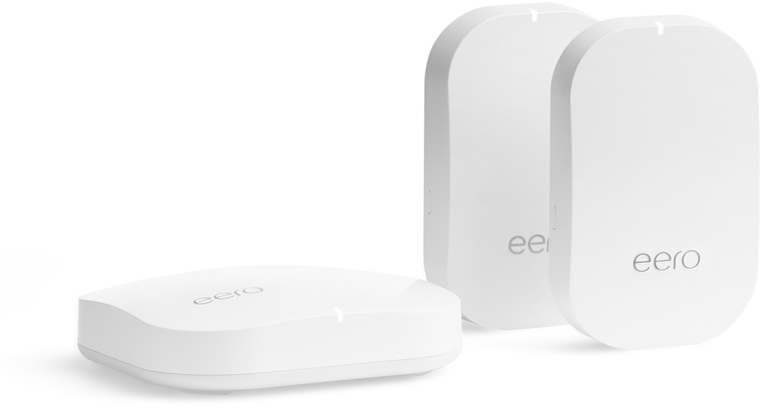 Customize or expand your WiFi by adding as many eeros as you need. TrueMesh WiFi hops between eeros to travel down hallways or go around walls. Most other WiFi systems only allow for one hop in any direction — so something as simple as a wall can mean that your devices can’t get the WiFi they need. This WiFi system allows for more hops with less speed degradation so you can cover any home and navigate around any obstacle. The app guides you through setup and placement in less than 10 minutes. With the app, you can check your network status, connected devices, and run speed tests from the app dashboard. Run a health check to quickly diagnose any issues and get helpful tips on how to make your network run even better. Grant access to friends and family, or share a separate guest network with out-of-town guests or your babysitter. You can also create profiles to set schedules, and pause the internet on any device. By setting up distinct profiles for each family member, parents can fi lter out objectionable or violent content to keep the kids safe online. Or turn off the WiFi when it’s time for homework, family dinner, or bed time. There are slow or dead spots in my home. I have a lot of devices on my network, and some of them don’t work well. Everyone in the house is constantly using the WiFi. I have no idea how to update my firmware or software. I don’t want my system to quickly become outdated. I have trouble streaming some TV content in my bedroom/kitchen/office. I keep adding WiFi devices like Alexa, doorbells, lights, and air monitors to every corner of my house. I want to add IP cameras and security to my WiFi network. TrueMesh ensures every inch of your home is covered in fast, reliable WiFi. Gorge Net’s enhanced Whole Home WiFi system adjusts to accommodate any number of devices. You can manage your family’s screen time with Family profiles, block devices, or even pause the internet. Software and security is updated automatically without you lifting a finger. This WiFi system actually gets better with automatic updates, including better speed and expanded device support. This WiFi system puts “entertainment-grade” WiFi in every room of your house. All of these devices will have a strong connection, no matter where in your home you put them. You’ll be able to deliver enough bandwidth anywhere you need it, even for resource intensive devices like IP cameras. Goodbye dead spots. Hello totally reliable WiFi.